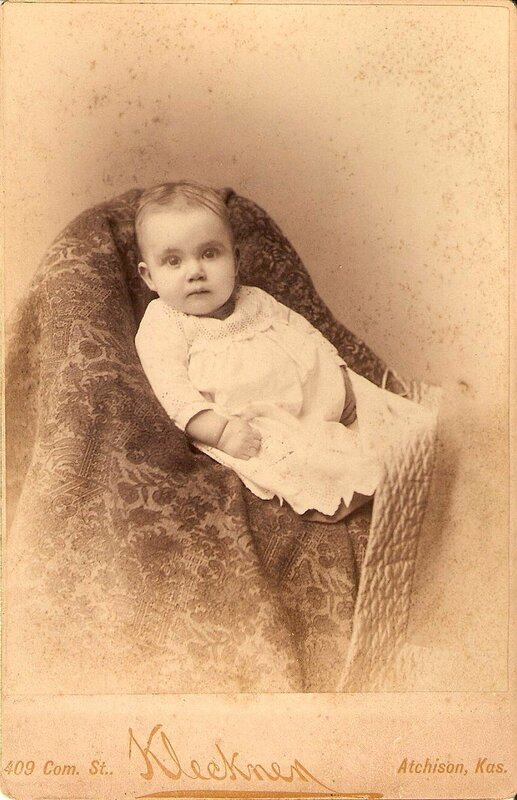 Thanks to QuelleBooks, I’m obsessed with finding these “Missing Mother” portraits. According to the fascinating and unnerving post on Retronaut, “This was a practice where the mother, often disguised or hiding, often under a spread, holds her baby tightly for the photographer to insure a sharply focused image.” Some are more subtle than others and it’s amusing to see feet peeking out beneath heavy tapestries. I found this photo at a little antique store in Greenup, Illinois. What I find so intriguing with this one is the extensive work the photographer did during the printing process to “burn and dodge” out the mother’s head. There is also a strange double exposure on the right hand side, near the baby’s feet. it seems clear to me that the mother’s arms are around the baby, and that her head has been “photoshopped” out, Victorian style.